Leafmining caterpillars | Infonet Biovision Home. Citrus - Phyllocnistis citrella; Groundnut and soybean - Aproaerema modicella; noch weiter recherchieren! 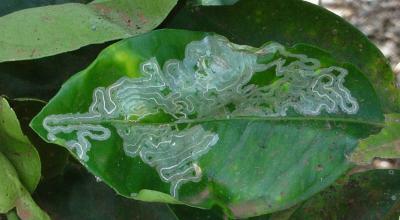 The caterpillar of the citrus leafminer usually attacks young leaves and shoots. It mines the undersurface of young leaves, but it can attack both leaf surfaces, in heavy infestations, and occasionally the fruit. Its feeding causes serpentine mines that have a silvery appearance and reach a length of 5 to 10 cm. The middle of the mines is marked by a light or a dark coloured stripe, which consists of the excreta of the caterpillars. The caterpillars are greenish yellowish and are to 4 mm in length. Caterpillars pupate within the mine, near the leaf margin, under a slight curl of the leaf. The moths are tiny (2 to 3 mm long), greyish white in colour with fringed wings. Eggs look like small dew drops and are usually laid on the underside of the leaves. Attacked young leaves are twisted, show brown patches of dead tissue and eventually fall off. Heavy infestations can interfere with photosynthesis because of the reduction in leaf surface. 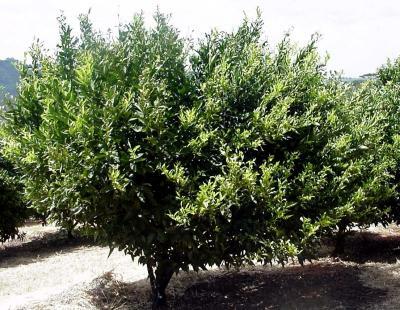 This pest is especially troublesome in citrus nurseries. It can kill young nursery plants. This leafminer was a frequently observed pest during a survey of major citrus pests conducted in Kenya, Malawi, Uganda, Tanzania and Zambia in 1995 (B. Lohr, personal communication). In Asia, mineral oils and neem extracts (neem seed extract 2%) are recommended for control of the citrus leafminer (Tandon, 1997). Neem water extracts (1kg neem cake / 10 l water) has given protection against this pest for up to 2 weeks (Zebitz, in Schmuttererr, 1995). In South China 1.4% emulsified neem oil gave protection against this pest in the nursery and also in young and old citrus trees (GTZ, 2001). For more information on Neem click here.